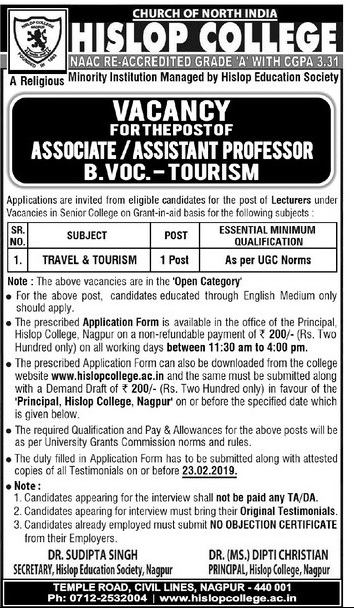 Hislop College, Nagpur has advertised in LOKMAT newspaper for the recruitment of Associate Professor / Assistant Professor jobs vacancies. Interested and eligible job aspirants are requested to apply on or before 23rd February 2019. Check out further more details below. About College : Hislop College is not just an institution but a byword for excellence, a synonym for quality, and a signature of the best in higher education. The story of Hislop College began more than a hundred and fifty years ago, when a young Scottish Missionary, heeding to the call of the Master, Jesus Christ, set out for India with fire in his belly and dreams in his eyes. In 1846, Rev. Stephen Hislop started a boy's school in old Nagpur with only 30 students. Qualifications: As per UGC norms. Salary: As per UGC / Govt of Maharashtra / RTMNU norms. How to Apply: Interested and eligible candidates are requested to apply in the prescribed application form available in office of the Principal, Hislop College, Nagpur on a non refundable payment of Rs.200/- between 11.30 am to 4 pm on all working days. Applications can also be submitted in the downloaded format along with DD of Rs.200/- in favour of the PRINCIPAL, Hislop College, Nagpur on or before 23rd February 2019. Send application to the address mentioned below with attested copies of all testimonials.